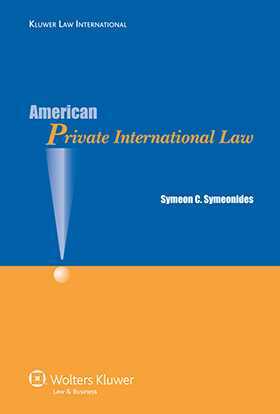 This volume is an authoritative and complete yet compact presentation of private international law—or ‘conflict of laws’—in the United States of America. Its author is a “conflicts giant” (60 Stanford Law Review 247 at 249 (2007)) and “the world’s leading expert on comparative conflicts law today.” (M. Reimann, “Comparative Law and Private International Law,” in The Oxford Handbook of Comparative Law 1363 at 1380 (2006)).Having studied and taught law in both Europe and the United States, the author is uniquely qualified to identify and explain in language understandable to readers outside the U.S. the American peculiarities of the subject. His three-decades experience in writing on thousands of American judicial decisions is particu-larly valuable in understanding and presenting the practical essentials of the subject to practitio-ners and academics alike. American courts encounter, at a rate of more than two thousand per year, conflicts among the laws of the fifty U.S. states (interstate conflicts) and between state or federal laws and those of foreign countries (international conflicts), thus making American conflicts law one of the richest and most complex in the world. This volume explains the differences between the two categories and presents the established and emerging jurisprudence in a concise and clear manner, while also providing an enlightening discussion of the multifaceted role of U.S. federalism, which is essential to the foreign reader’s understanding of American conflicts law. • choice of law in torts, products liability, contracts, status and domestic relations, property, marital property, successions, and statutes of limitation.